The updated visual has been published and will propagate over the next day. 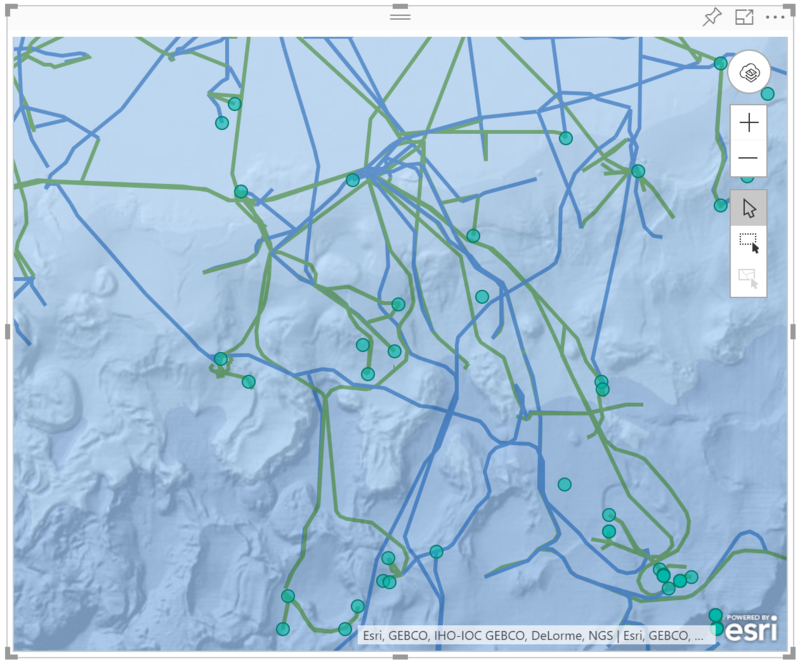 When we introduced ArcGIS Maps for Power BI in partnership with Esri, we saw the immense power of secure organizational geographic information systems (GIS) to help business users make accurate decisions. Esri’s “Science of Where” philosophy enables sophisticated geospatial analysis to be distilled into web maps, curated and shared through Esri’s ArcGIS Online platform. Now that ArcGIS Maps for Power BI supports connecting to ArcGIS Online, secure organizational GIS data can be used in dashboards and reports distributed throughout the enterprise using Power BI. Whether you’re in oil and gas, transportation, government / civil response, or an NGO, locating the most urgent places to take action is critical to your organization. Often ArcGIS Online is the place where you curate maps and reference layers created by your GIS specialists to support your decision making. Power BI is the place to bring together data from any data source, enabling end user analytics and collaboration by business users. So, with the new capability, you can bring your rich set of GIS insights directly to your business users. 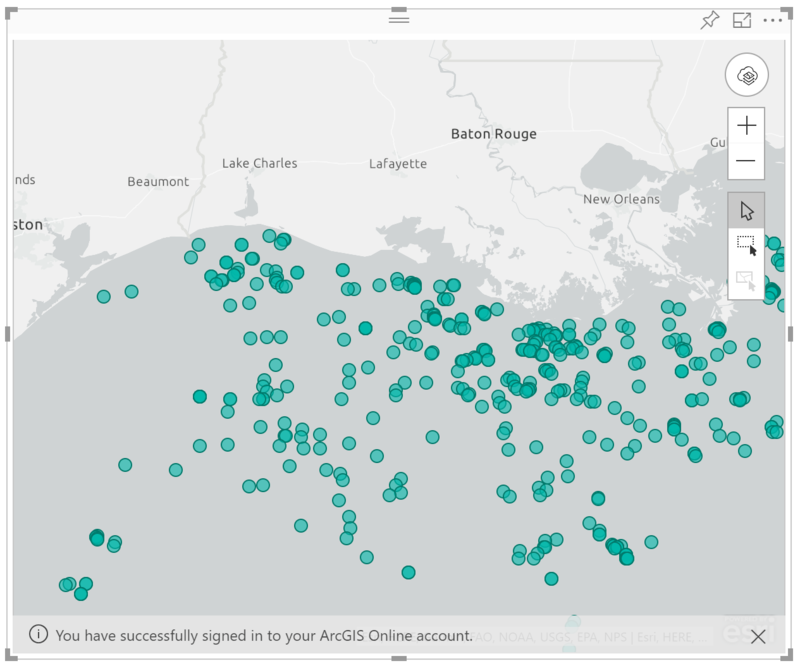 a. ArcGIS Online sign-in is supported in Power BI Desktop and Power BI Service. It is not available for Publish to web or Embedded scenarios at this time. a. To access ArcGIS Online sign-in, you will need a map with location data loaded onto it. Once you have those things, click or tap on the gold icon in the top right of the ArcGIS Maps visual. You will see a 'Connect to ArcGIS' button. Click or tap on it and sign in with your ArcGIS Online credentials. Upon successful sign-in, the gold logo will turn white and a message at the bottom of the map will indicate you have successfully signed in. You can now access private content from your ArcGIS Online organization such as custom basemaps and secured feature layers. In the screenshot below I have added a custom Oceans basemap made for me by my mapping department and a private layer showing pipeline locations and production status. The basemap and private layer were uploaded to the ArcGIS Online organization I logged into. Since Esri introduced Plus subscriptions in fall 2017, there has been strong interest by organizations to enable more geospatial analytics for their users. Now, we’re happy to announce that Esri is making it easier than ever for entire organizations to purchase Plus. Users with Plus subscriptions get access to more basemaps, more locations per map, and global demographic data for use in the ArcGIS Maps visual. Organizations can purchase Plus for their entire organization by selecting a small, medium, or large plan based on how many potential Power BI users are within their organization. To talk to an Esri representative about purchasing Plus subscriptions for your organization, fill out the form at www.esri.com/powerbi and Esri will contact you within 24 hours. Can I connect ArcGIS Maps for Power BI to ArcGIS Enterprise (on premises/hosted)? The ArcGIS Maps for Power BI visual supports ArcGIS Online. You can publish your ArcGIS Enterprise layers to ArcGIS Online using the steps outlined here. Can I use any layer or web map hosted in ArcGIS Online? ArcGIS Maps for Power BI supports hosted feature layers from ArcGIS Online for use as reference layers. You can use one layer at a time, and web maps are currently not supported (support for multiple layers is something Esri is considering). Where can I submit feature requests for ArcGIS Maps for Power BI? Head over to Esri’s GEONET community to submit your ideas. You’ll also find it is a great place to interact with Esri’s experts. Here’s the link. Something’s not working, where can I get support? Your Esri Product Support Services agreement covers integrations between ArcGIS Online and ArcGIS Maps for Power BI. Here’s the contact page. Can an ArcGIS Online signed-in user consume content created by a Plus subscriber? Yes! Users with ArcGIS Online credentials can view all content created by users of the free visual and Plus subscribers. We have more than 10,000 Power BI users in my organization – how do I purchase Plus for my organization? For organizations with more than 10,000 Power BI users (ie, larger than a 'large' Plus for organizations subscription), contact Esri via the form on the product page for pricing. Is “free” ArcGIS Maps for Power BI still available? Yes! You can continue to enjoy the included capabilities of ArcGIS Maps for Power BI without cost. 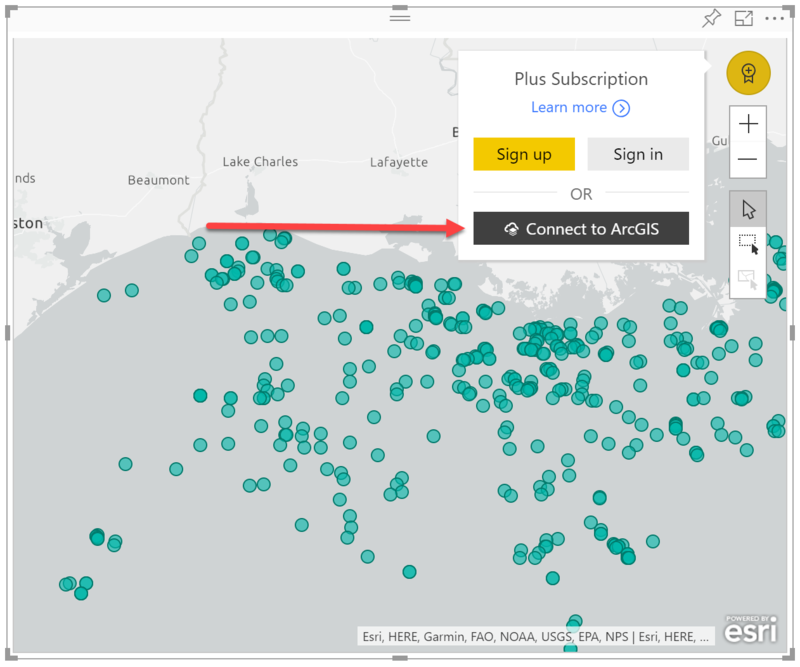 You can also rest assured that Plus subscriptions and ArcGIS Online support are there for you when you’re ready to bring more GIS to your Power BI users.